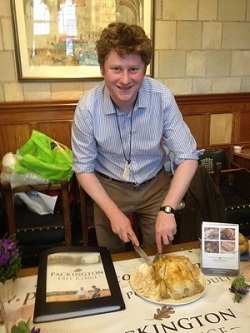 Packington in Parliament | Packington Free Range | Born and reared outdoors. Always. In early February, the Packington team were invited down to London for the day, to attend the 2013 Staffordshire Food Festival! The event took place inside the House of Commons which was an experience in itself, but the day as whole was a great success! The festival aimed to raise awareness and showcase the best of Staffordshire produce on a nationwide platform, and gave us the chance to express our pride for our local food and drink suppliers. The day was hosted by Tamworth MP, Christopher Pincher, and there were a number of senior politicians who also attended. Most small, local producers rarely have the opportunity to promote all that they do outside of the county which is a shame – often they’re the suppliers that deserve the most recognition for their skills and business ethos. The Staffordshire Food Festival was the perfect occasion to really show off what great food and drink we have right on our doorstep. The festival was the perfect opportunity to see lots of Staffordshire producers, some familiar faces, some new, and I think it’s fair to say that everyone was really chuffed with the level of enthusiasm throughout the day. We took some of our best Packington food with us of course, and ran out of chicken pretty swiftly. Luckily we had some pork pies on standstill for such an occasion. We look forward to more events in the future that aim to raise awareness of all is great in Staffordshire!